IT was originally intended that the History of the Scotch Poor Law, should form an appendage to the Author's account of the Poor Law of England; but he found, as he proceeded, that the materials which it was necessary to collect and arrange in order to afford a complete view of the subject, increased so much in bulk, and assumed a character of so much importance, as to warrant their publication as a separate work, and hence the appearance of the present volume. Although now published separately, both the English and Scottish Histories may however for the present purpose be regarded as one; for the Poor Laws of the two countries were so nearly identical in their origin, and for a time were likewise so similar, in spirit and operation, that a certain knowledge of both is necessary to a right understanding of the character, and a full appreciation of the advantages and disadvantages of either. They are in fact, or rather in their progress they became, the opposite extremes of the same system; and they should both be kept in view when seeking to arrive at a sound conclusion as to the nature and extent of the assistance that may with safety, and at the same time with advantage, be administered at the public charge in relief of destitution. The Irish Poor Law, it may be remarked, is a compound of the English and Scottish systems, deriving nearly as much from the one as from the other, and aiming at embodying the excellences, and avoiding the defects of each. 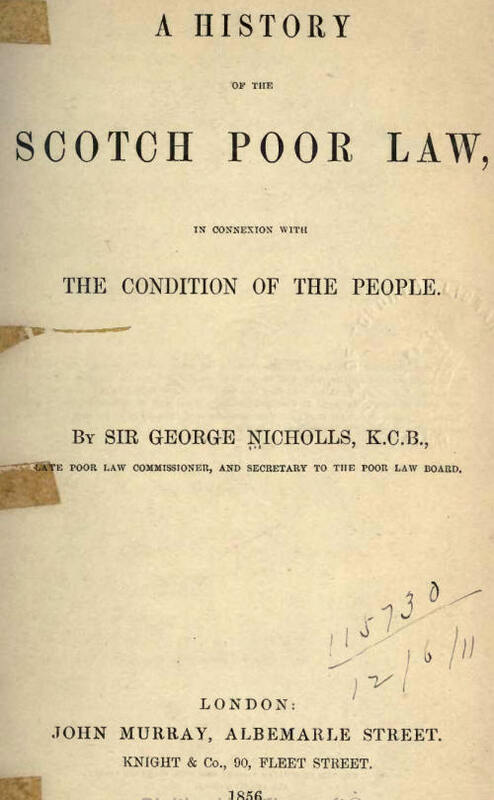 The Author was required to take a prominent part in the framing and introduction of the Irish Poor Law, and this made it especially necessary that he should make himself acquainted with the Poor Law of Scotland. He mentions this as one reason for his venturing to I undertake the present work, and it may be stated as a further reason, that during many of the best years of a now somewhat protracted life, it has been his fortune to be connected with the Poor Law question—not speculatively only, but practically, and on the most extensive scale—in England as well as in Ireland; and his attention could not therefore fail of being much directed to what had been done, and to what was doing in Scotland. The Author's inquiries in this direction were necessarily extended, when he commenced the preparation of his `History of the English Poor Law,' with which the Scottish law is so nearly allied. Both systems had grown up together, and although they afterwards diverged, that of Scotland assuming in a great degree the nature of an ecclesiastical institution, whilst the English system retained its purely civil character; we now again find the two systems approximating, and promising to become one, or as nearly one as the circumstances of the two countries permit or render expedient. Notwithstanding therefore, that the Author has not had the advantage of being practically engaged in administering the law in Scotland, he trusts that his long connexion with the general subject will exempt him from the charge of presumption, in thus undertaking a History of the Scotch Poor Law, in preparing which he has endeavoured to apply the practice and the experience of one country, in elucidation of the events in the other. It is right however to observe, that he has not relied upon secondary researches entirely, but in order the better to qualify himself for the task, he has twice visited Scotland with the view of obtaining information on the spot, as to the condition of the poor, and the present working of the law; on all which points lie received the most frank and cordial assistance from the Board of Supervision in Edinburgh, and likewise at the several local institutions that he visited. The interest which the Author felt in the question as it applied to Scotland, was certainly not lessened by what came under his observation on these occasions. On the contrary, all that he then saw of the people and the country, greatly increased the interest he had taken in their well-being, and made him if possible more desirous of contributing to promote it. If the present work shall help in any way to that end, be it in ever so slight a degree, he will feel amply rewarded for whatever pains he may have taken in its preparation. Condition of Scotland in the middle ages — Desire of English sovereigns for a union—Clanship and feudalism — Legislation on the subjects of mendicancy and vagrancy down to the abdication of Mary — Laws of James VI. : Act of 1579, the basis of the Scottish poor-law — First notice of gipsies or Egyptians — Parochial chargeability — Acts for promoting Bible-reading and psalmody — Acts against beggars and vagrants — Divergence of English and Scotch laws — Powers of kirk sessions and presbytery — Acts of 1617, 'anent the Justices' and 'anent the Poor' — Acts against 'Egyptians'— Highland clans — State of clanship — Population. Laws of Charles II. : Establishment of manufacturing incorporations — Dearth of capital and lack of employment — Duties of justices --- Overseers of the poor — Regular and casual poor — Ability and disability — Over-facility of relief — Compulsory labour — Privileges of employers — Chargeability by residence — Correction-houses — Treatment of poor — Apprenticeship —Punishment of vagabonds. — Laws of William III. : Proclamations for maintaining the poor and repressing beggars. — Summary of enactments. -Other Acts — Against drunkenness and swearing, profanation of the Lord's day, theft and depredation — Act for encouragement of manufactures —Bank of Scotland — 'Act anent murdering of Children' — Parish schools -- The Union — Assessments — Amount of relief — Numbers relieved - Pauperism of Scotland and England. The lord advocate's speech on introducing the bill 'for the Amendment and better Administration of the Laws relating to the Relief of the Poor in Scotland' — Summary of the Act — The board of supervision constituted --- Its first, second, and third Reports. Fourth Report of the board of supervision — Occurrence of cholera — Fifth and sixth Reports — Distress in the Highlands and Islands; Sir John McNeill's Report — "Crofters," "Tacksmen," "Tenants," and "Cottars" — Kelp manufacture — Results of the Croft and Cottar system — Emigration the only remedy— Administration of relief in the western districts — Seventh and eighth Reports --- Sir John McNeill's Reports on Caithness, and on the free and pauper colonies in Holland — Divergence between the English and Scottish systems of relief — Present practice in Scotland —Approximation of the Scottish and English systems—Conclusion.